Northern Transportation Company Ltd. of Hay River, Canada, conducted a major refit of a quad screw, pusher-towing tug, the Edgar Kotokak. The installation of customized, Nautican High-Efficiency Nozzles and Triple Rudders boosted the tug’s performance in challenging waters, increased its maneuverability and generated significant cost savings. Design Engineer: Robert Allan Ltd. The Edgar Kotokak’s owner, NTCL, is a pan-Arctic marine operator providing comprehensive marine transportation and related services throughout Northern Canada and the Arctic. The tug works on the Mackenzie River between Hay River and Tuktoyaktuk. Whether going up- or down-river, tugs face unique challenges. 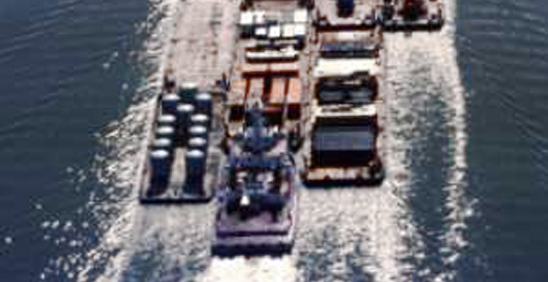 Typically, the vessels push two rows of three barges abeam. The Mackenzie River current averages five to six knots, so going downstream presents a challenge for keeping the barges in the channel. There are also several areas where the rapids are fast enough that the tows have to be broken up before proceeding. Going upstream can also be difficult as more horsepower is required; but going against the current slows things down, allowing the tows to be larger—up to four rows of three barges across. Originally the Edgar Kotokak had four open propellers in tunnels for propulsion with twin, transom hung rudders behind each prop for steering. During the refit, NTCL replaced all four CAT D399 V16 engines (1125 hp at 1225 rpm) with CAT 3512B Electronic engines (1410 hp at 1600 rpm) and replaced the Edgar K’s 56” open propellers and each twin rudder with 48”, Nautican High-Efficiency Nozzles—customized for this vessel—and triple rudders. This installation was the first shallow-draft application of Nautican’s Triple Rudders, and the first time that the company supplied the nozzles and rudders integrated as one unit. The nozzles were specially adapted for shallow water operation, ideal for the Edgar K’s work on the Mackenzie, with the bottom of the nozzle flattened to provide as much draft as possible. The nozzles were built with a head-box that housed the rudders together with the rudder stock, bearings, links and seals. The rudders were mounted on a removable cover plate to provide access for replacing the propeller. This pre-mounting saved significant shipyard installation time. Robert Allan, Ltd. provided design and engineering services for the refit. RAL’s Chris Mulder, Senior Project Engineer, supervised the post-refit, bollard pull trials on the Hay River. The accompanying figure shows that not only did the larger engines produce more bollard pull, as expected, from 60,000 lbs. to over 100,000 lbs., but the Nautican Nozzles produced more thrust at the same horsepower, almost 60 percent over the open propeller and 10 percent over Kort nozzles at 4400 hp. The Nautican Nozzles are 10–15 percent more efficient at towing speed than Kort nozzles and the engines 5–10 percent more fuel efficient. Additional fuel savings come from the Triple Rudders, eliminating the need to reverse the engines on one side when turning around bends on the river.